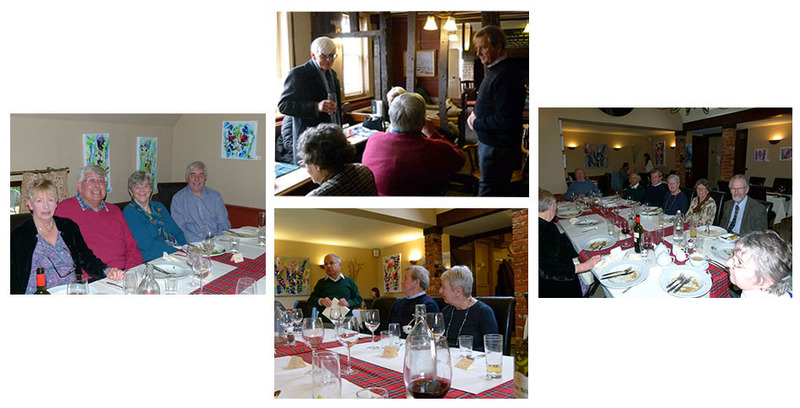 The Eastern Region New Year lunch was held at the 'Golden Fleece', Braughing for the third time. As usual the food and service were excellent. Conversation flowed freely thanks to the clever arrangement of the tables and provided an opportunity to discuss the Group including how to increase membership and how to facilitate more people attending regional events. Another very successful gathering. 13 members (including 2 ex-members) of North East Region convened at the Bridge Hotel & Spa, Wetherby for our 2018 Annual Christmas Lunch. This was a new venue for the group and all seemed pleased with new arrangements and menu. A private room was laid on and this offered fine views together with our own Christmas tree and log fire. All very festive. As usual the company was excellent with plenty of talk about favourite recent Shelley purchases. Everyone had bought their own Shelley or Wileman cup for coffee though strangely these were put aside in favour of regular white hotel-ware. Hmm! 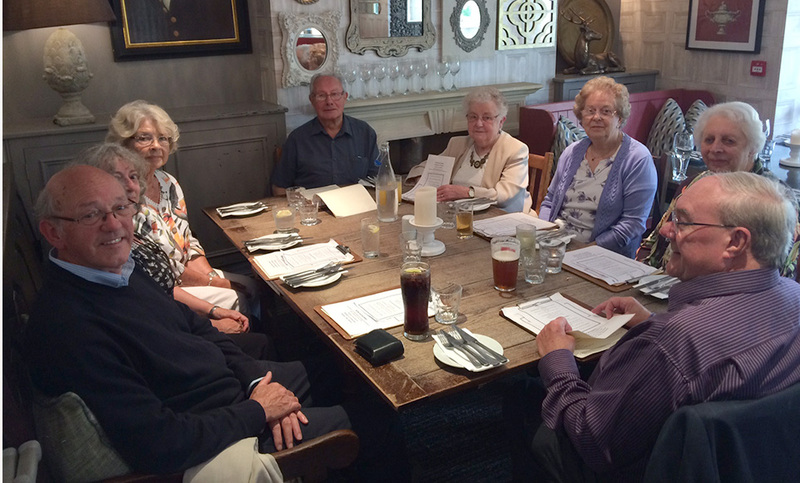 Newly appointed North East Regional Representative, Olwen Dudgeon, organised an informal lunch at the Wheatley Arms, Ben Rhydding - on the edge of Ilkley Moor (of Baht 'At fame) for members of the Shelley Group. Eight past and present members attended on what was one of the many sunny days we have had in the region recently. Once again the Stoke on Trent City Archives, which house the collection of the Shelley Pattern Books, was opened for a private visit by members who attended the Shelley Group Annual Weekend and AGM. Some 15 members poured excitedly over these priceless designs which until last year largely remained hidden from public view. Comments such as 'Wow, I have never seen that pattern before' and ' I never realised how detailed the drawings were - how did they draw those patterns to wrap around intricate shapes and without computers? - were voiced by many. Our annual New Years Lunch was held again at the Surrey Downs Golf Club. This has become a favourite venue for both pleasant surroundings and generous amounts of tasty food - the carvery was excellent as I’m sure all will confirm. In total there were 24 attending. It was nice to be joined by a number of members from other regions - we welcome you with open arms! By popular request people brought a small Shelley item to discuss at the table (I’m sure there may have been a few side deals taking place). We were all tremendously pleased to welcome Doug Burridge and family. With the recent loss of Jill we hope we as a group can offer some support; Doug’s sisters and brother in law had travelled from Scotland / Derby. We look forward to future events in the coming year. The AGM is coming soon and hopefully a number of 'get togethers' in the South. A roaring log fire welcomed us into the bar of the Golden Fleece on a miserable January Saturday. Before we sat down to lunch we raised our glasses in memory of our honorary president, Ray Reynolds, who will be so sadly missed by us all. Paddy had brought along small pieces to focus our conversation on matters Shelley . I was particularly taken with a tiny posy bowl. It had been made by Royal Doulton at the time of the first Shelley exhibition which was organised to promote the publication of `Shelley Potteries `by Watkins, Harvey and Senft in 1980. There is always something new to learn! The purpose of the brainstorming session will be revealed to those attending the Annual Weekend at the end of April. Where better to feast your eyes on wonderful Wileman Intarsio than at the Foleys? 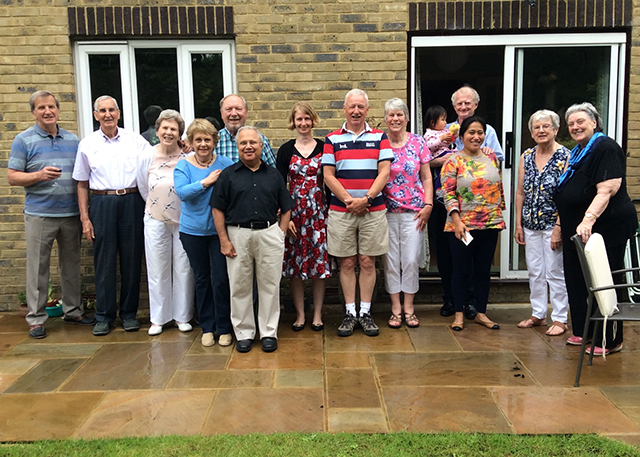 Fourteen members gathered at Les and Enid's home, sadly without Les as he was hospitalised after a recent fall. Enid was determined that the show must go on despite Les's absence and what a show it was. Aided by family members a splendid spread had been prepared topped again by one of Enid's famous cakes. The big question - 'What attracted people more - the china or the cakes?' Those who attended certainly know! We wish Les a speedy recovery and hope he will return home soon. What could be better than an antique fair and a regional "At Home" on the same day ? 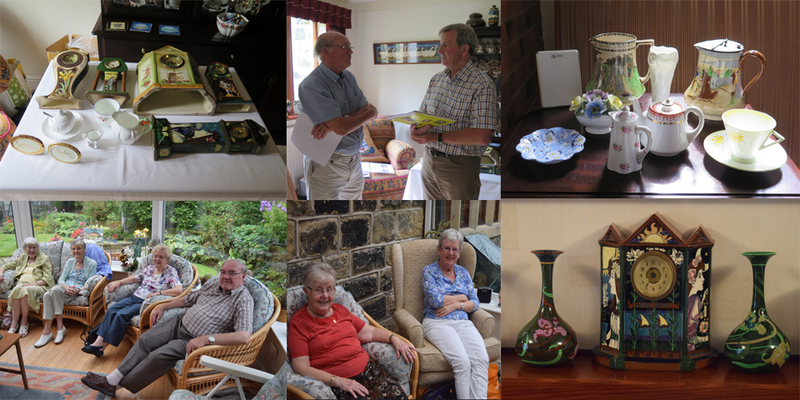 Sheila kindly hosted an 'At Home' in her new home, which coincided with the Woking Art Deco fair. So after a quick spin round the fair (and a couple of small purchases) I headed over to Sheila's. There was a great turnout and we were happy to welcome a new member (and family). A sumptuous spread was provided and heartily tucked into. There was a theme of lady's names and Elaine acted as the compaire - she gave us a marvellous display of knowledge and innocence. Sheila had a piece with name Olive - a recent purchase (day before) at a local auction for next to nothing. Eve, Daisy, and Queen Anne also featured. A big thanks to Sheila and we all wish her well in her new home. PLEASE NOTE: Details of the Annual Weekend and AGM are now on a separate page.